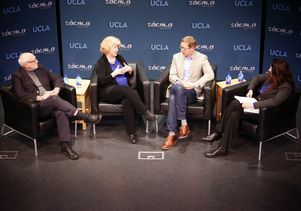 UCLA professor Joel Aberbach, Wake Forest professor Katy Harriger, UCLA Law professor Jon Michaels and KCRW’s Madeleine Brand discuss presidential power. Can a sitting president be indicted? Can a president pardon himself? 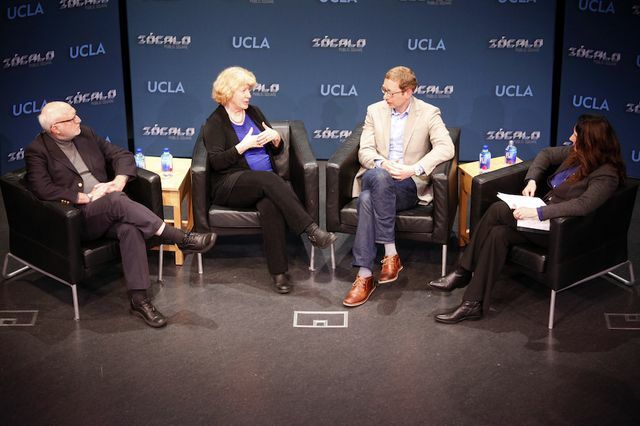 These were just some of the questions a panel of experts answered at the National Center for the Preservation of Democracy during a jampacked Zócalo Public Square/UCLA Downtown event titled “Are American Presidents Above the Law?” The panel included Jon Michaels, UCLA constitutional law scholar, and Joel Aberbach, political scientist and former director of the UCLA Center for American Politics and Public Policy, as well as Wake Forest political scientist Katy Harriger. KCRW’s Madeline Brand served as moderator. The panel noted that because Trump has often contradicted himself and made numerous inflammatory statements, it’s difficult to pinpoint exactly what he’s said and when. “It’s an irony,” Aberbach said, “that his bad reputation in many ways is a strength in this particular setting rather than a weakness.” The way the Trump administration has turned both cultural and legal precedents on their heads, the panelists agreed, complicates the legal picture. Other topics discussed include the likelihood of Trump being indicted, legal norms, the consequences an impeachment could have, the current state of the judicial branch and the 25th amendment. The panel concluded the night with a Q&A during which they encouraged everyone to vote. The panel affirmed their belief in the power of the ballot box, and stressed that the best way to restore confidence in American democracy is to vote for candidates who are committed to checks and balances.